On the rare occasion that I go out for brunch or breakfast, information pills it’s not the French Toast or Pancakes that grab my attention, page It’s the salty, starchy stuff. The eggs and omelets, the hash browns and tater tots, the hot sauce. If I see a “skillet” type thing on the menu, I’m probably ordering it. There’s nothing more satisfying than browned and crisp potatoes, smoky bacon and some eggs. 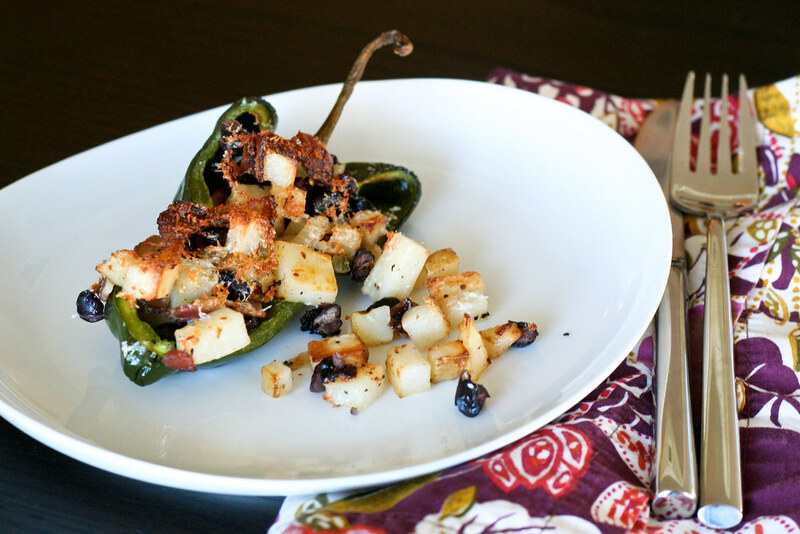 So, when I found myself wondering what to make with the random ingredients leftover from the week – poblano peppers, a potato, some eggs and not much else – breakfast-style stuffed peppers came to mind. No matter that it was 3pm on a Sunday afternoon, I love breakfast any time of day. I sauteed some peppered bacon until crisp, then cooked onions and potatoes in the bacon drippings. Toss everything together with some black beans, stuff into peppers, top with grated Cotija cheese and bake. The peppers roast in the oven while the potatoes, bacon and cheese brown perfectly into a salty, crisp crust. Top with a poached egg (not pictured), and you’ve got the breakfast (or dinner) of champions. Preheat the oven to 325°. Set a large skillet over medium heat and add the bacon. Cooke until the bacon just begins to brown, about 7 minutes. Remove to a bowl with a slotted spoon. Add the onions to the pan with the drippings and saute until they begin to soften, about 5 minutes. Add the potatoes and continue cooking, stirring frequently, for another 10 minutes until the potatoes soften. Remove the potatoes and onions to the bowl with the bacon. Add the black beans and toss until evenly combined. Grease your favorite casserole dish or lasagna pan and arrange the halved peppers on them, open-side up. Spoon the potato mixture evenly into each. Top with grated Cotija cheese. Bake for about 40 minutes, or until the peppers are roasted through and the tops are browned and crisp. If you’re serving these with eggs, begin poaching or frying your eggs when the peppers have about 5 minutes left in the oven. Serve each pepper with a poached or fried egg on top (Optional). i am so with you on the salty, savory breakfast foods. skillets, bacon, eggs — yes, yes, and yes. and yes to this stuffed pepper, also. Bacon and cotija with potatoes is genius. I’m a total savory breakfast/brunch person too. Give me my eggs, bacon and cheese and I’m a happy girl!